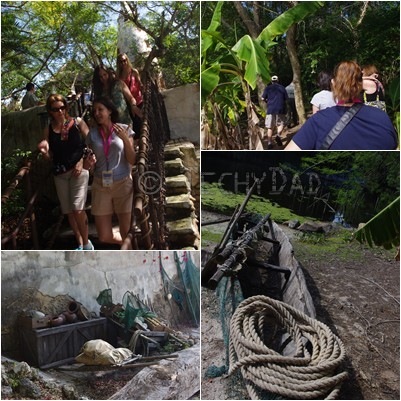 While at the Disney Social Media Moms Celebration, I was given the opportunity to go on the Wild Africa Trek. Since B did this last year and had such a good time, I couldn’t resist. I just had to try it. We arrived at Animal Kingdom and, as we waited for our tour to begin, took in some of the local scenery. Our tour guide soon arrived and got us all ready to go. For the first time that day, we were allowed past a gate that usually keeps Disney World guests out. 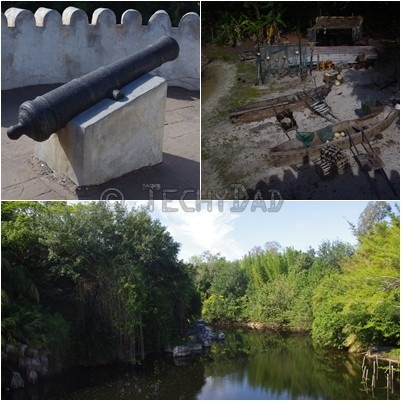 Then, it was down some stairs, past some boats sitting beside a lake, and into the jungle. Once we arrived at the Trek "home base", we were welcomed and given lockers to put our stuff (wallets and the like) in until the Trek was over. 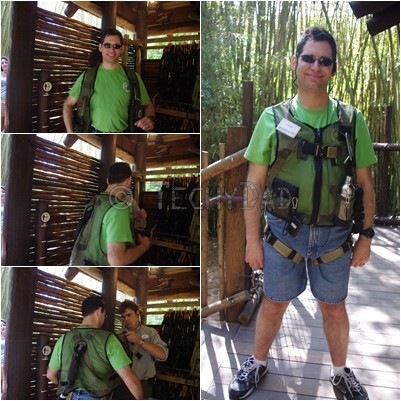 You can take your camera with you, provided it has a neck strap or can be clipped onto your harness-vest. 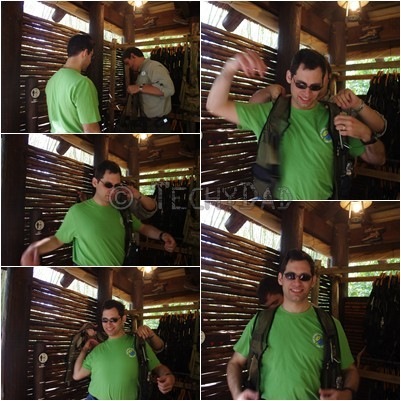 Oh, yeah, we were suited up into harness-vests. These aren’t just for fashion, but are important to your safety. There are clips and pockets over it to help keep your gear secure, but most importantly is the monkey tail. This is a long, tail-like, apparatus that will come in handy later. We were also fitted with earpieces and receiver units so we could hear our tour guides no matter what the background noise or how far away from them we were. Very handy if you find yourself in the back of the eleven person tour travelling single file through a forest trail. After being suited up, it was time to tackle a rope bridge. This was practice for the big bridges we’d encounter later. After this, we were given the chance to apply sunscreen and bug repellent. We were offered some Pog juice – that’s passionfruit, orange, and guava juices mixed together. It’s insanely good, but we wisely didn’t drink too much. After all, the next restroom was a 2 hour hike away! Luckily, though, we didn’t need to rely on that one drink to last us for two hours. We were also given water bottles to fill up (and keep) so we could take drinks along the way. This is, of course, vitally important if you plan on hiking in the heat for a couple of hours. With everyone geared up and ready, we were given some final instructions and then off we went. 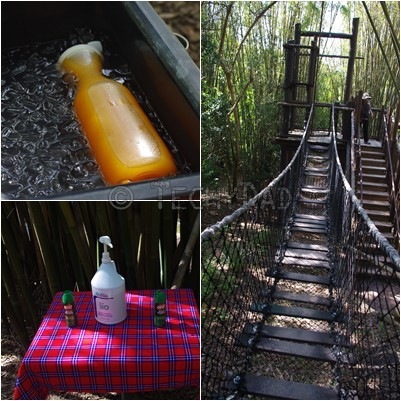 You actually begin the Trek along the Pangani Forest Exploration Trail which is accessible to the public at large. I’m sure quite a few folks wondered who the identically vested people were and where they were headed to. After seeing some birds and monkeys, it was time to boldly go where no normal Disney vacationer has gone before (well, at least not since the last Trek group). Yes, we were heading back into the forest and going off-road. Here, we had to watch our steps. Although there was a trail to follow, tree roots and uneven ground made walking a little more tricky compared to the flat, even pavement. After a short hike, it was time to put the monkey tail to the test. 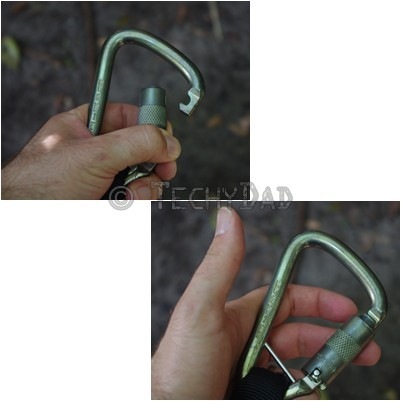 We were shown how to unhook and rehook the clip on the end. The hook springs shut, so we were told to always hand it to the guides closed. Trying to help them by opening it up for them might result in an injury on their part. As we were clipped onto a railing, we walked out onto a ledge. Ten feet below was a pond. And in the pond was a hippopotamus. The hippo didn’t seem to care that we were on the ledge above, but as our guides informed us, entering into his waters would be a deadly move. 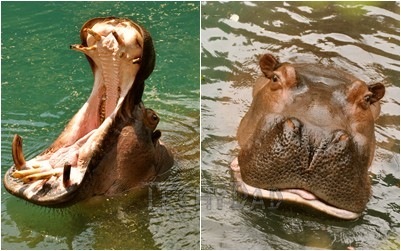 You see, hippos might be strict vegetarians, but they are very, *VERY* territorial. If anyone whom they consider a threat comes into their area, they will attack. Combine this with their sleeping habits – they sleep underwater with their body naturally surfacing them when they need to breathe – and you can find yourself being suddenly attacked when you stray into a "hippo-less" area that is actually a hippo’s turf. Even crocs won’t take on a hippo. At most, they might go after a baby hippo, but that’s only if they are literally starving. After all, if you think "you’re in my water" hippo is angry, just think of how angry "you’re trying to eat my baby" hippo would be. The hippo didn’t seem to want to react to our guides. 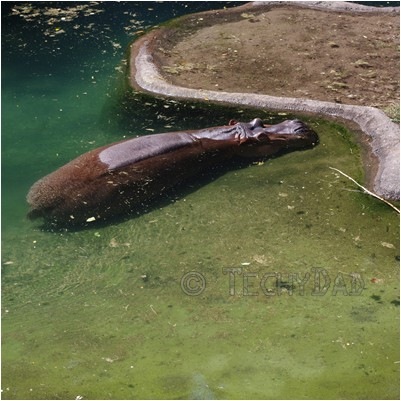 Though one banged on a bucket filled with delicious greens, the hippo simply opened one eye and then decided to go back to its nap. 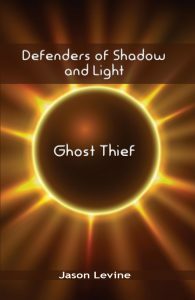 More on the CD in a later post. Once we left the hippo’s pond, we unclipped and moved on to the next challenge that would await us. Remember those rope bridges we tackled earlier? Those were about eight feet off the ground. These next two were about thirty feet in the air. Oh and some of the planks had "rotted" away so you had to watch your step. 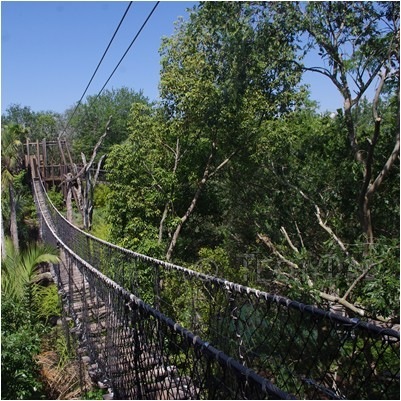 In my next DisneySMMoms post, I’ll recount how we crossed the bridges and what awaited us on the other side.